If the end justifies the means then this prop is going to be worth everybody’s time and effort. This cool floating grim reaper made mostly out of black iron piping could be one of the coolest additions to any haunter’s graveyard. Floating close to 10′ off the ground, the only trick is to shield the base from view as illustrated in this photo. 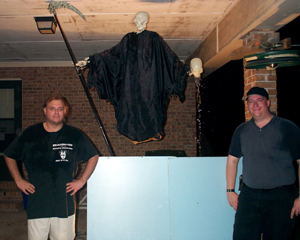 Dating back to 2003 this prop tutorial comes to us by the Evil Geniuses Howard I. Scott, III and his partner in crime Ron.